Pastor Juan Rodas, moderator of the Presbyterian Church of Honduras, loves to tell the story of how two remote churches, El Horno and El Sute, joined the denomination. The communities of these churches are at the top of a mountain in the department of Comayagua, Honduras. 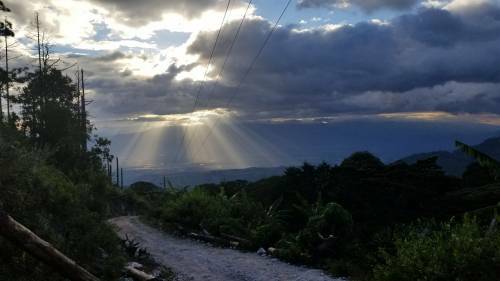 They are so remote, so small and so economically poor that the utilities that built electric transmission lines overhead, crossing the mountaintop, didn’t bother to connect the communities to the lines. Most people in the communities are of indigenous Lenca descent and are farmers, of coffee, mostly, and of corn, beans and other staples. There are roads, but not good ones, so most people walk, or if they’re well-off, ride mules or horses. It’s a five-hour walk to the nearest paved road. Pastor Juan and his father-in-law, Pastor Edin Samayoa, arrived in El Horno after walking five or six hours with the intention of informing the congregations’ leadership of the decision. Some church elders sat and had coffee with the pastors and related the story of how their churches came to be. The missionaries who came to evangelize years prior had been from a larger denomination. They had spent the time they needed to preach the gospel in the towns, but when it came time for the churches to become independent, the missionaries left, saying they couldn’t join the larger denomination because the communities “no son rentables.” In English: The communities weren’t profitable. They wouldn’t be worth the investment of time and effort of a larger denomination. El Horno and El Sute were drains on the resources of the missionaries. I love the affection that Paul shows for the church in Philippi; it reminds me of Pastor Juan’s affection for El Horno and El Sute. “This is my prayer, that your love may overflow more and more with knowledge and full insight … having produced the harvest of righteousness that comes through Jesus Christ for the glory and praise of God.” How telling that the harvest he speaks of is not of financial or demographic increase but of righteousness, glory and praise. Holy Trinity, you bring abundant life. We pray that your liberating love and word transform lives so that they may know your glory has broken down all barriers that divide. In the name of your great freedom we pray. Amen.